I absolutely love Pilates and my studio! As I mentioned in “Things That Make Me Smile,” my studio does both physical therapy (PT) and Pilates, which is a great combination. 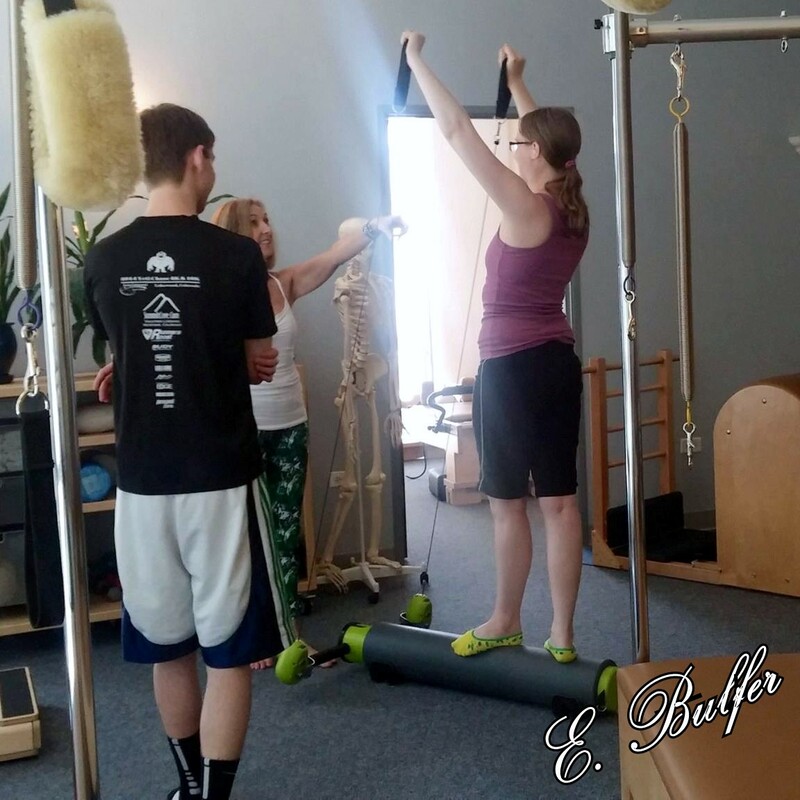 The PT is much more focused on a whole body approach to treat the issue, and the Pilates is done with an emphasis on proper form and tailoring to your specific needs. Some of the instructors are both PTs and Pilates trained, others are just Pilates trained. All of the instructors have undergone 500 hours of Pilates instructor training… which is crazy, but really good for the students. I’ve been working with one PT, Joleen, there since January. My body has so many issues that it’s just significantly easier to stay with a single instructor for now. Once my body starts working kind of like a “normal” person’s body, then I’ll be comfortable trying other instructors. I’m getting WAY better though. I’m on the MOTR, a relatively new Pilates device. It’s extremely versatile. This was during an open house at my studio. Today was a one-on-one session. I was oddly weak today, but I pushed myself through it. I really wish I didn’t have to do that. I probably shouldn’t push myself that hard, but I’m desperate to start making my body function again. I don’t know what is going on with my body; it’s all out of whack today. Last night, as we were driving back from my father-in-law’s house, I suddenly got very warm. Turned out I suddenly started running a low fever (my normal is 97.6F, I was at 99F), but it may have just been due to not being able to regulate my temperature. Anyway, I took Tylenol and then went to sleep. I thought I was over the fever thing when I woke up, but then I stood up and it came back… more Tylenol. Now I’ve been on the couch since 9:30a (it’s noon), and I think my fever is back. I drank something cold though, so I have to wait to take my temp (my ear one seems to be acting up). I can’t take Tylenol again for another hour. Ugh. I’m hoping that I’ll be able to write again later, I have some random post ideas that aren’t depressing. I’ll at least try to post tomorrow. Elizabeth B. • This entry was posted in Chronic Illness, Dysautonomia and tagged chronic illnesses, chronically ill, confused, depression, Dysautonomia, exhausted, fibromyalgia, potsie, spoonie. Bookmark the permalink.